Earlier today Disney announced on the Disney Parks Blog that beginning May 2 at 10 AM (Disneyland Time), guests will be able to start making reservations to visit Star Wars: Galaxy’s Edge at Disneyland. Specific details on how to make reservations will be available on the Disney Parks Blog and Disneyland.com on May 2 at 8 AM PT. In order to be able to make a reservation guest will have to be staying in a Disneyland Resort hotel. Guests staying at a Disneyland Resort hotel between May 31 and June 23, 2019 will receive a designated reservation to access Star Wars: Galaxy’s Edge during their stay. One reservation per registered Guest. Each Guest is required to have valid theme park admission. If the hotel reservation is cancelled, the Star Wars: Galaxy’s Edge reservation will be cancelled. Access to certain experiences in the land are subject to capacity and other factors. Additional restrictions apply. While Disney has not officially stated on the Disney Parks Blog, reports are stating that Disneyland will restrict guests with free Star Wars: Galaxy’s Edge reservations to a 4-hour time limit during the initial “soft opening” period. Disneyland has stated that no stand-by visitors will be permitted to enter Galaxy’s Edge. After June 23 reservations will not be required and Disneyland has not specifically mentioned how crowds will be handled for this highly anticipated land, though there has been rumored to be some sort of FastPass system that will be implemented. If you have any questions on regarding Galaxy’s Edge during the initial opening period, I would suggest contacting Disneyland or checking out the Disney Parks Blog for more information. Disney just announced that guests will be able to step into a cartoon world and join Mickey and his friends on Mickey & Minnie’s Runaway Railway, which will be coming to Mickey’s Toontown in 2022! This attraction will be the first Mickey-themed ride-through attraction at Disneyland. It will put guests inside what Disney describes as the wacky and unpredictable world of a Mickey Mouse cartoon short where anything can happen! Once you step into the cartoon world of Mickey and Minnie, you’ll board a train with Goofy as the engineer. Then, one magical moment after the next leads you to a zany, out-of-control adventure filled with surprising twists and turns. Also tucked into the announcement was that the opening of Mickey & Minnie’s Runaway Railway at Disney’s Hollywood Studios has been pushed back to sometime in the Spring of 2020. While Disneyland’s version will be located inside Mickey’s Toontown, an exact location was not mentioned in the announcement. In the Disney Parks Blog today Disney made a series of announcements that will affect many guests. The biggest of which was that beginning May 1st, smoking will no longer be allowed inside Walt Disney World or Disneyland theme parks, water parks, ESPN Wide World of Sports Complex or Downtown Disney in California. In the announcement Disney stated that designated smoking areas will be available outside the entrances of the areas listed above and at Disney Springs in Florida. For guests who have room or dining reservations, smoking areas are also available at Disney Resort hotels. The next announcement was in regard to strollers. Also beginning May 1st, Disney is requiring that strollers be no larger than 31″ (79cm) wide and 52″ (132cm) long. According to the announcement many strollers on the market, including many double jogging strollers, fit within these size guidelines. They also reminded guests that wagons will not be permitted in the parks beginning May 1st. According to Disney, these updates are designed to help with guest flow and ease congestion. While Disney is stating that this is an “adjustment” to the stroller guidelines, I’ve been told that this might actually be an “emphasis of enforcement,” but I don’t have definite information on that. The final announcement affects guest bringing in coolers into the parks. Beginning today, loose or dry ice are no longer permitted in the parks. Ice packs will be permitted though. The Indiana Jones Adventure at Disneyland is one of the park’s more popular attractions. Have you ever wanted to learn about the secrets located in the detailed queue but have never had the time? While the Indiana Jones Adventure attraction undergoes a short refurbishment at Disneyland, the park is offering guests the chance to explore the ride’s impressive queue. Announced in a tweet from @DisneylandToday we learned that guests can take a walking tour of the Indiana Jones Adventure: Temple of the Forbidden Eye queue for a limited time. These tours will be offered from 12:30 p.m. to 5:30 p.m. today and tomorrow (Thursday). Disney noted that guests do not need reservations for this tour and that Cast Members were waiting at the ride’s entrance. A spokesperson for the Disneyland AP account on Twitter confirmed this week that visitors over 21 years old will only be allowed to drink in the confines of the upcoming Oga’s Cantina at the new Star Wars: Galaxy’s Edge attraction. Hello, Rachel! At this time, Guests will be required to stay in Oga’s Cantina while enjoying alcoholic beverages. 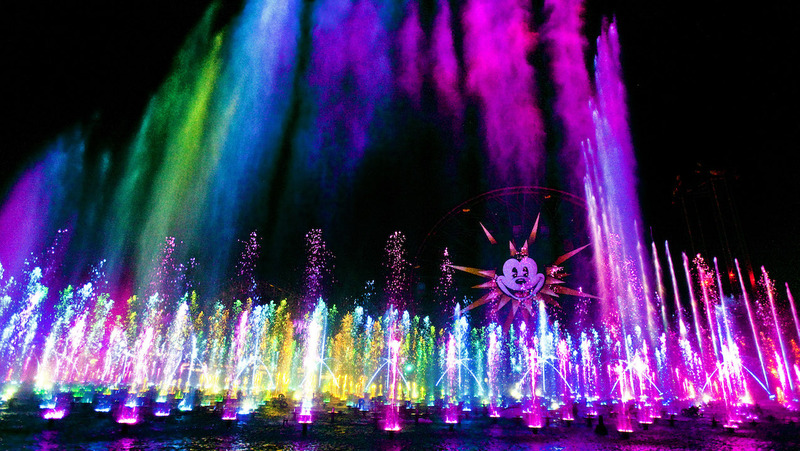 It looks like World of Color, the fan-favorite nighttime water-based show at Disney California Adventure, is finally making its long awaited return. Based on the availability of the World of Color Dessert Party reservations for booking, it appears that the show will be returning at or around Friday, February 22nd. It appears that Friday is completely booked and has no availability, while there are still open reservations for Saturday the 23rd and beyond. The special ticket event includes reserved seating in Paradise Gardens Park and access to a dessert selection and sparkling beverages and costs $79. If you’re excited for ‘Ralph Breaks the Internet’ and going to be in Walt Disney World or the Disneyland Resort soon, you’re in luck. Today Disney announced for a limited time you’ll be able to get a sneak peak of the movie beginning in November. Guests at Disney’s Hollywood Studios will get to see this advance look at a portion of the film, starting Friday, November 2, as part of the Walt Disney Presents attraction. At Disneyland, the preview of “Ralph Breaks the Internet” will be shown in 3D at the Tomorrowland Theater. This limited sneak peek experience will be presented by Mailchimp at Disneyland Resort, November 9 – December 9. In the movie Ralph and Vanellope leave the comforts of Litwak’s arcade in an attempt to save her game. This quest takes Ralph and Vanellope to the vast world of the inter webs…a world Vanellope seems to wholeheartedly embrace, making Ralph worried that he may lose his best friend. It doesn’t look like this sneak peak will be around for long, so if this interests you and you’ll be in the parks at the time, I encourage you to give it a visit. Disney has given us another glimpse into what Star Wars: Galaxy’s Edge will be like yesterday when it announced that Oga’s Cantina will be coming to Galaxy’s Edge in 2019. According to the announcement, the musical entertainment will be provided by an old friend of ours, RX-24, the former StarSpeeder 3000 pilot droid from Star Tours. Captain Rex has re-envisioned himself as the cantina’s quirky and talkative DJ. Trowbridge encourages guests to be ready to listen to some unique music, taste the best drinks in the galaxy, and be surrounded with a colorful cast of characters. Star Wars: Galaxy’s Edge promises to be a totally immersive experience and Oga’s Cantina certainly seems to be following that promise, making it what seems like a must-see experience for guests. Oga’s Cantina will be coming to Star Wars: Galaxy’s Edge in 2019 at both Disneyland and Walt Disney World. According to the Orange County Register the new hotel that was planned to begin construction at Anaheim’s Downtown Disney last month has been indefinitely put on hold after Disney and the City of Anaheim could not agree over the terms of the development. From previous reports the new upscale hotel had been slated to have 700 rooms spread over the west end of Downtown Disney. This included the site of the former Rainforest Cafe, ESPN Zone sports bar and restaurant, the AMC Theatres and the popular Earl of Sandwich restaurant, which closed in June to make way for the new construction. Construction had been expected to start July 1. The new hotel was scheduled to open in 2021, making it the fourth Disney-owned hotel at the Disneyland Resort. According to the Orange County Register, Disney pulled the project because they could not reach an agreement with the City of Anaheim over terms under which the hotel was to be constructed. Disney’s move was in response to an August 6 letter in which Anaheim City Attorney Robert Fabela told Disney that a change in the site plan would make the hotel ineligible for expected tax incentive rebates. “Given the city’s position that our project does not comply with the requirements of the Agreement, you have given us no other choice other than to put construction of the hotel on indefinite hold,” David Ontko, chief counsel for Disneyland Resort and International Parks & Resorts wrote to the city attorney Wednesday. It was unclear late Thursday whether the city would revisit the issue, now that the hotel has been removed from the planning agenda. What is not known is how this development will affect any construction already under way and the what will happen with locations that formerly housed the above restaurants and theater. The galaxy that was far, far away and a long time ago just got a little closer. On Tuesday, Disney announced that the highly anticipated Star Wars: Galaxy’s Edge will open in summer of 2019 at Disneyland and in late fall 2019 at Walt Disney World. Up until this point, all Disney has said about possible opening dates for either location was they would open in 2019. While the announcement does not indicate a month or a date for the openings, it does indicate a couple of things. First of all, it somewhat coincides with a lot of the rumors that the Disneyland version would open sometime during the summer next year. With the statement of “Late Fall 2019” for the Florida version, this seems to confirm that construction there is behind Disneyland’s, which is in line with what many of us thought. There had been rumors that construction at Walt Disney World had been closing the gap. Either that speculation was wrong or if they have closed the gap that construction was even further behind than we had thought. No specific date summer date was announced for the Disneyland opening. There have been rumors that the actual date may be as early as late June or early July. There also has been speculation, especially with how the return of Fantasmic in 2017 was handled, that Galaxy’s Edge may not open until sometime around the D23 Expo which returns to Anaheim August 23-25, 2019. At this point, it’s all speculation and no one really knows. Hopefully we’ll get more detailed information soon, but I personally would expect anything substantial until early spring 2019.